Dr Roa Altaweli, a student from the School of Health Sciences, is the first midwife from Saudi Arabia to obtain a PhD. 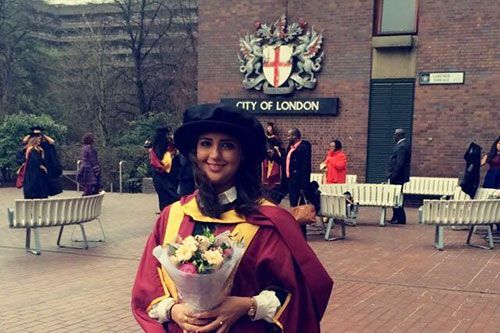 Awarded her doctorate at the City University London graduation ceremony on Friday, Dr Altaweli’s thesis investigated the use of interventions during the second stage of labour and explored what may affect their use in Jeddah, Saudi Arabia. Born in Jeddah, Dr Altaweli is a registered nurse and midwife, holding a BSc in Nursing from King Abdulaziz University in Jeddah. After obtaining a Postgraduate Diploma in Midwifery from Bahrain, she was appointed as a midwife at National Guard hospital in Jeddah and then a teaching assistant at Dar Al Hekma University. Following work as a midwife, Dr Altaweli decided to pursue a more academic route by achieving a Postgraduate Certificate in Advanced Practice of Midwifery from Kings College London, and an MSc in Midwifery and PhD in Midwifery from City University London. Starting the PhD in 2010 and finishing the thesis last year, she is currently applying for jobs in Saudi Arabia in universities and hospitals. Dr Altaweli is also the vice-chairperson of the Saudi Midwifery Group (SMG) that was recently established in August 2015.